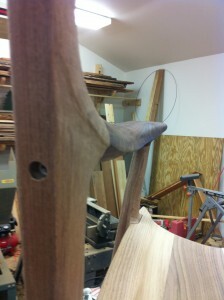 I have been sanding and shaping on my chair for the last couple of weeks. It’s going a little bit slow what with Christmas shopping and the holidays, but progress continues. I think I finally have in my head what Chuck Brock is talking about when he refers to hard lines and soft lines. A hard line is what you end up seeing when a flat meets a round for instance, and you make sure that the junction line between the two surfaces is well defined and visible. You should be able to run your finger along the line and have a reason for it being there. It is difficult to keep these lines even and consistent, and then when you get the shaping done and start the sanding process, you have to be careful not to sand the line away. It takes a lot of sanding and shaping to get all of this right. These lines are subtle, unexpected, and delightful to find in the chair. 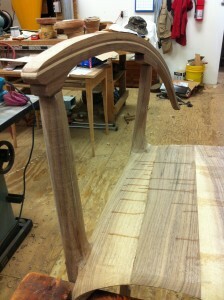 I am also in the process of shaping the left rocker. Again, this shape is much more subtle than it first appears. I started to work on the back end of the rocker and it appears I have a lot of material to remove to make it turn out graceful and delicate. I drilled the hole in the rocker and put in the dowel to connect the rocker to the front leg. There is a lot of shaping required at the intersection of the two parts and you can see from my pictures that I have only begun to make it right. Course the other side of this coin is that there are two sides of everything and they need to match. 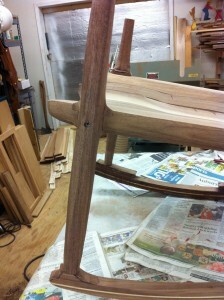 I think the hardest part of sculptural projects like this is to make each side match the other. Most anybody can make one side and call it good, but the real test is to make the other side match. I mean look at your sideburns when you shave (or your eyebrows if you pluck them). 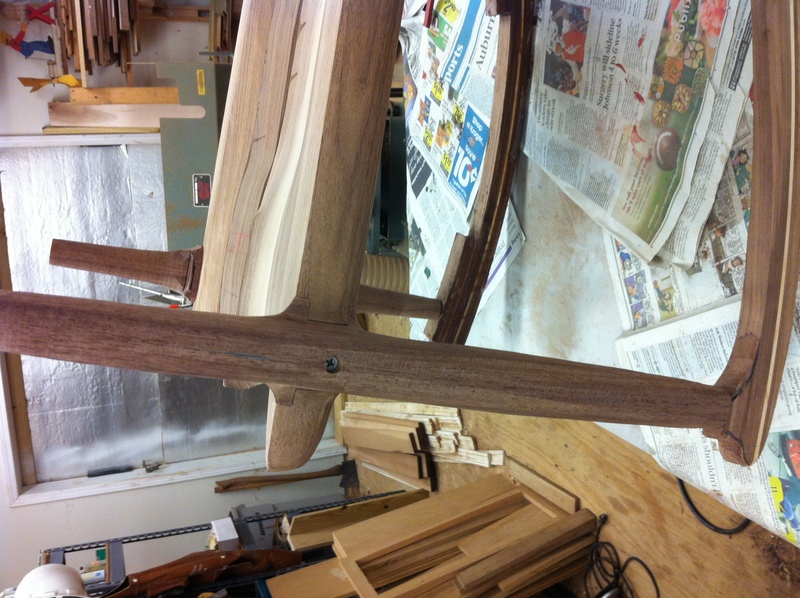 Next up – I will continue to sand, finish, and shape the intersections of all the pieces. 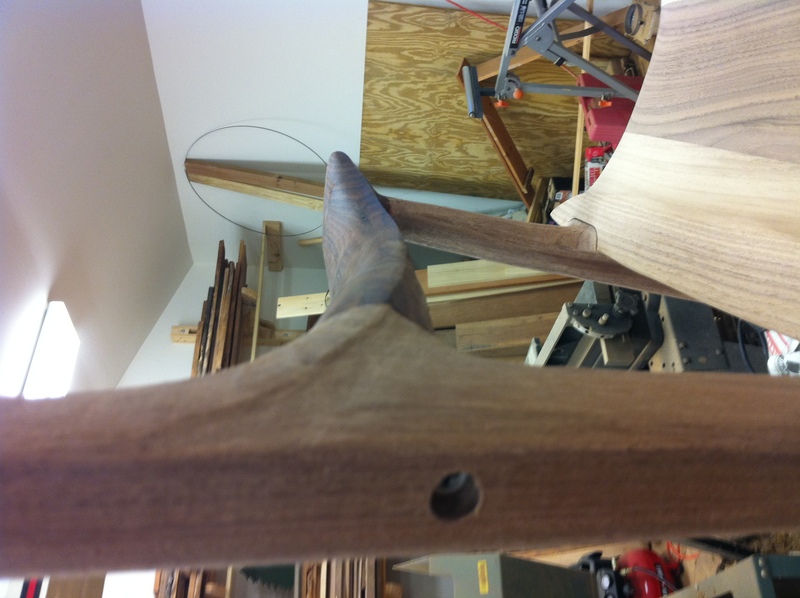 It is looking more and more like a chair. When I get the left half completely done, we’ll set it up at Highland Woodworking for you to drop by and see. 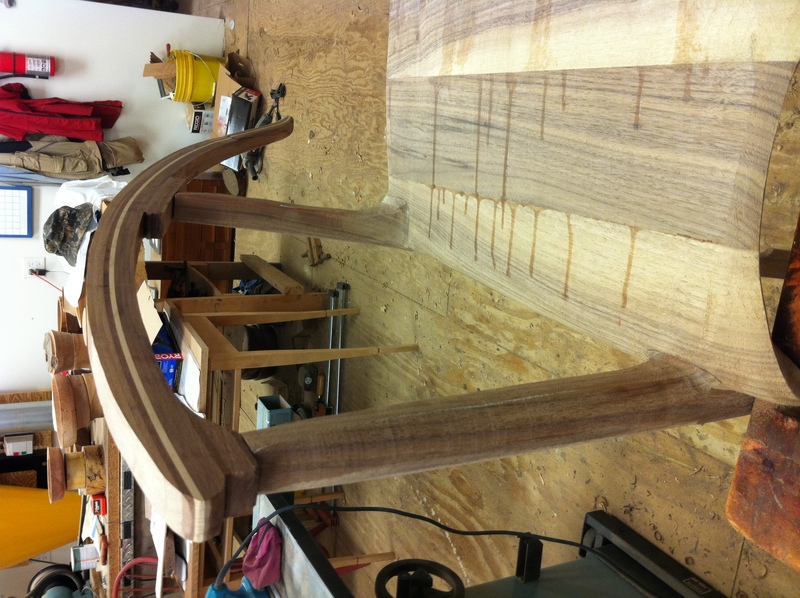 I use a mixture of Walnut with sapwood as Sam Maloof did. I use Common grade as Sam did in the seat and FAS in the legs. The common boards contain more sapwood but provide more interest than FAS walnut in that there is movement in the grain around knots and other swirling of the grain, including the color variations caused by the inclusion of some sapwood. Over a period of time light causes a darkening of the entire patina including the sapwood. So much of the seat material is going to be removed that judging the face of the seat board is not entirely significant. The juxtaposition of diverse walnut boards really makes for a beautiful seat. A concept I laughingly refer to as “juxtapositional diversity”. The Plane Facts: Planes for finishing – the Scraping Planes Lie-Nielsen Hand Tool Giveaway Winner Announced!